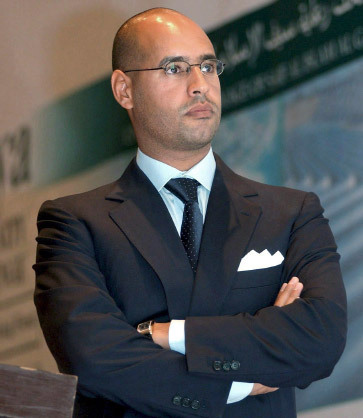 Here is Saif al-Islam Gaddafi, son of Libyan dictator Muammar Gaddafi, as he presents himself to the west: a civilized gentleman with a Ph.D. from the London School of Economics. How many Ph.D.s go around wielding AK-47s like that? How many Phd's have the opportunity to inherit several billion dollars in wealth and possibly take over the family business which could provide him and his heirs with additional billions? In terms of game theory, he has everything to gain by fighting and everything to lose by surrendering. The international community has publicly announced that it is trying to seize his families overseas assets worldwide. So if he fleas the country (assuming he can find a country to take him) he probably has close to nothing. There is also a movement to try him as war criminal at a UN criminal court. If he stays in Libya and surrenders again, he loses billions and probably goes to jail or just gets shot. So its probably more rational for him to fight than just about anyone on the planet. If he stays and prevails, he is still a billionaire. If the overseas governments seize his assets, he can nationalize overseas assets in Libya to partially make up for this loss. If the international community wanted him out, they should have provided more incentives to encourage him to leave. When the US provided a safe haven for the Marcos regime or the Shah, the leaders fled with there billions rather than fight. We could have done the same thing here.